Listening to the user base and specifically hot tub users, the Lovibond® team has now redesigned the Scuba II to include a direct test for Bromine (0.2-13.5mg/l). Concurrently, the team has also introduced new, enhanced housing for this popular domestic photometer. Easy, immediate and accurate readings can be taken by scooping water into the unit’s sample chamber and adding a reagent tablet to generate a characteristic colour which is measured using the photometric principle. Numeric results are clearly displayed on the screen. 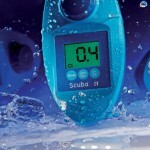 With five different parameters being measured in less than 10 minutes, it is the ideal solution for the discerning domestic pool or spa owner.